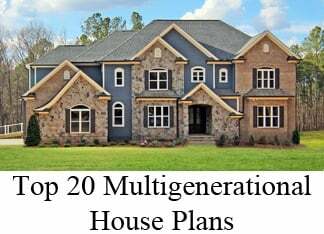 The most requested ceiling styles in new homes for North Carolina homebuyers are trending toward coffered, trey, barrel vault, and beam features. Here's a glimpse of their appeal, to help you choose your style. What makes a coffered ceiling great? A coffered ceiling is a specialty ceiling treatment, which divides a ceiling into a grid of recessed panels accented by dropped beams, usually in the form of multiple squares or rectangles. Each of the beamed sections is then finished with a variety of interior trim and moulding options. Stained coffered ceilings are firmly in the luxury price point, while painted approaches can create a very different effect with less investment. Recessed can lighting is especially effective with a coffered ceiling, and provides soft, reflective light throughout the room. What is so appealing about a beam ceiling? A beam ceiling is a specialty ceiling treatment that's increasing in popularity. While beams have been more traditional incorporated into a more rustic décor, they are increasingly evident in eclectic home designs that combine styles, such as contemporary-mountain. Beams placed in a vaulted ceiling can create interesting depth and contrast. Beams can be finished using a variety of hardwood or interior trim and moulding options. Beams can either be load bearing (incorporated into the actual structure of the home) or lighter weight faux beams that are designed for visual impact. What should be expected in a Conventional Ceiling? A "smooth ceiling" is flat. 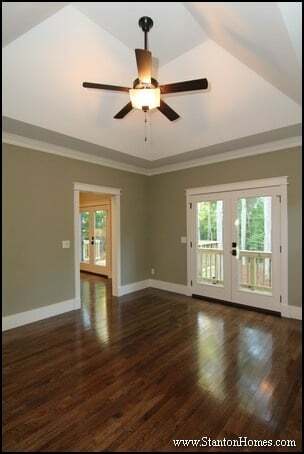 If your contract doesn't mention smooth ceilings, ask your builder what kind of ceilings come standard in your new home. 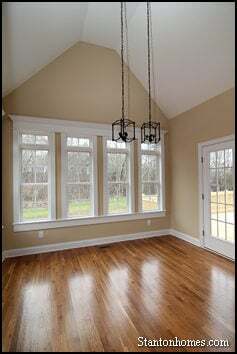 In a custom home, the first floor ceilings are often extended to 9 feet in height. 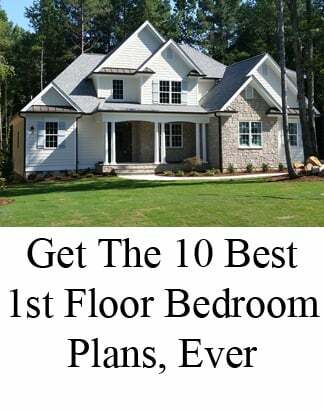 If your new home builder doesn't offer 9 feet as a standard first floor ceiling height, expect to pay $3,000-$9,000 to increase the height, depending on the size of the home. Why should you consider a Cathedral Ceiling or Vaulted Ceiling? A cathedral ceiling provides a high sloping line up to the top of the house. A vaulted ceiling extends a room upward. Both provide a spacious feeling and make rooms feel larger. While vaulted ceilings are generally found in first floor living or family rooms, dining rooms, master bedrooms, and master baths with a vault are becoming more popular in new homes. See one example in the photo to the left - taken from a version of the Carwile. This formal breakfast room incorporates a vaulted ceiling. 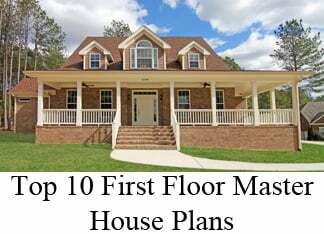 Main floor master suite homes also are more likely to have vaulted ceilings, as the second floor is generally smaller, which means that more first floor rooms are likely to have a roof directly over them instead of another room. Where does a Tray Ceiling create the most impact? A tray ceiling (also called trey ceiling) is an artistic element added to select ceilings to give them personality and a unique attribute. Trey ceilings start horizontally at the wall intersection and then are built upwards in a cut out resembling a tray. The cut can be vertical or angled, and the tray itself can be 6 inches to a foot or more deep. Sometimes there are a series of steps for an even more dramatic effect. Trey ceilings can be even more impressive when paint is used to accentuate the ceiling and vertical steps, as shown in the photo to the right. 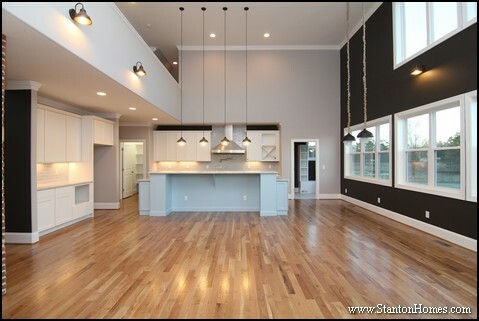 A trey ceiling can either be "dropped" or "raised" depending on what is above the room, and what the ceiling height is. Decorative mouldings or lights may also be incorporated. 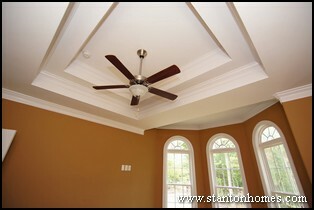 Trey ceilings are most common in dining rooms and/or master bedrooms. Trey ceilings are usually an upgrade in production homes, but top builders may include them as a standard feature in custom homes. 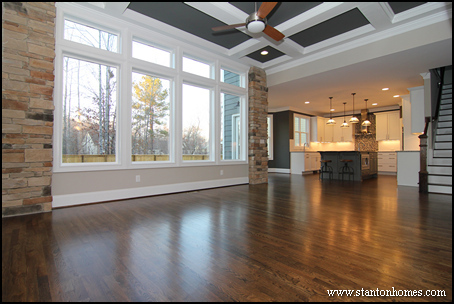 For example, Stanton Homes includes a variety of trey ceilings in every home they build - with the homeowner choosing their location where possible. As an upgrade, the cost from most home builders is generally around $1,000 for a simple cut out trey ceiling with no crown molding, and no variation in paint color. 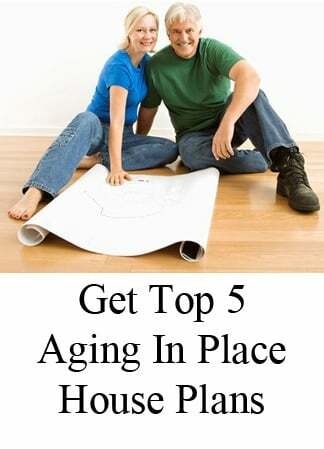 If the base plan for your new home doesn't include a trey ceiling, and you pay to upgrade, make sure to ask what kind of trey ceiling you'll be getting. Will there be one step or two? Basic box, or angles? Custom crown moulding in the trey? Custom color treatment? 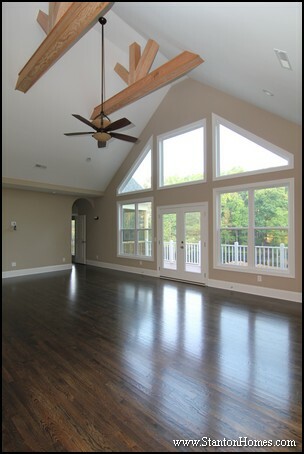 Not all NC custom home builders will work with you to custom design a trey ceiling - make sure to ask what is included. What's so special about a Barrel Vault Ceiling? 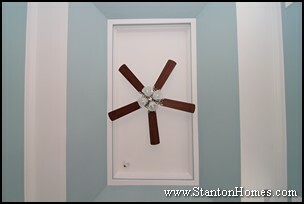 A barrel vault ceiling, also known as a tunnel vault or wagon vault, is not commonly seen in most homes, but can be a unique architectural feature in custom designs such as Stanton Homes, where this artistic element comes standard depending on the home's design. 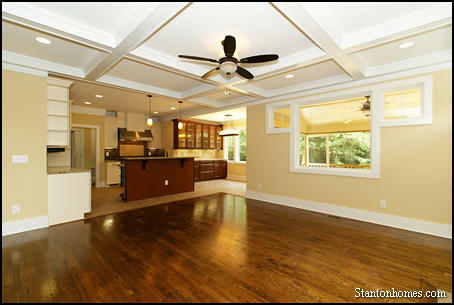 The photo to the right - taken from a version of the Bostwick - shows a two story foyer with barrel vault ceiling. The arched windows carry out the theme. 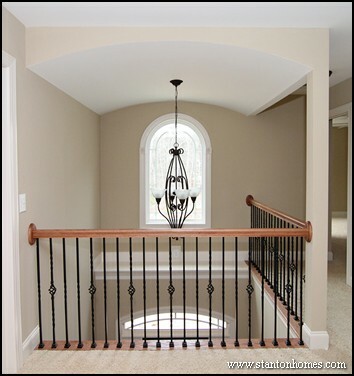 The iron balusters and oak handrail give a nice contrast to the rounded lines. There is a built-in plant shelf above the foyer, which add to the opportunity for personal home accents. Before you buy, find out what will be included in the home you purchase. Models can be deceptive, as they are often loaded with upgrades that can change their look dramatically. Ask very specific questions, and be sure your custom home estimate includes a very specific set of specifications. If you're a do-it-yourself kind of person, you may be able to add more trimmings to your home later, but keep in mind that it will be nearly impossible to add a trey ceiling, barrel vault ceiling, or increase a room's height after framing has been completed. 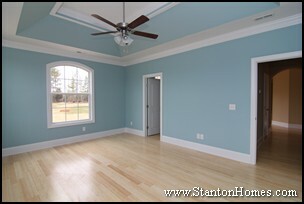 Each of the ceilings pictured in this blog has been created by Stanton Homes. We take pride in crafting a unique combination of ceiling treatments in every home we build - including dozens of styles of trey ceilings. The master bedroom is your retreat - and a signature trey ceiling can give you the detail, dimension, and depth you're looking for to make your personal space stand out. 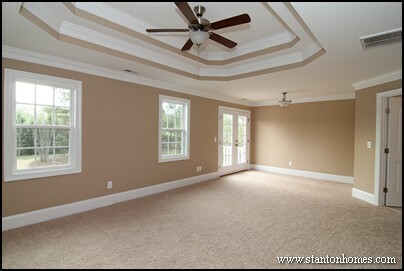 Stanton Homes offers ten standard styles of trey ceilings, including shallow step, step, vaulted, octagonal, angled, or single box. Or, let us design something unique. 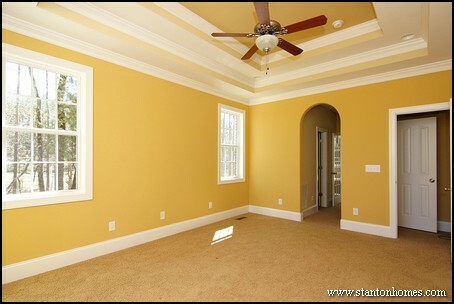 A typical Stanton Home includes TWO trey ceilings. 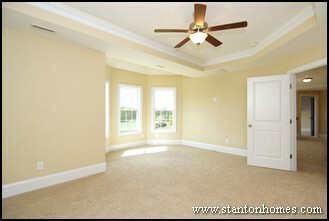 The master bedroom pictured to the right - the Kelley - features an angled trey ceiling custom designed by Stanton Homes. This trey ceiling emphasizes the placement of the master bedroom and private sitting alcove in a truly unique treatment. Watch a video tour of the Kelley. The depth or height of a trey ceiling can be limited by what's above - if there is a room directly above the master suite, the trey ceiling might "drop" rather than "raise" the ceiling, and is usually limited to about 6 inches or so. If you want your ceiling to stand out even more, then add a splash of color in the alternating trey sections. A custom home master bedroom can include all kinds of unique details. This double trey master bedroom ceiling was painted white to maintain a sharp contrast against the deep tan bedroom walls and rich hardwood floors. The home pictured here - the Lowery - was built by a couple returning to NC from Florida. They were yearning for a master bedroom that would be infused with deep, rich color tones as well as a sophisticated, executive style. They were continually drawn to deeper colors as a radical departure from their Florida home. Watch a video tour of the Lowery. 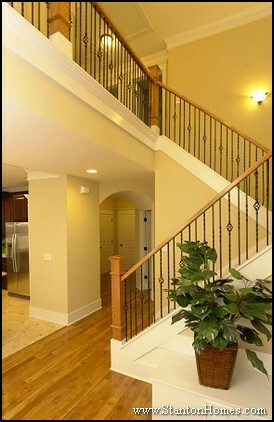 The width of the "steps" in a stepped trey ceiling can vary, changing the look and feel of the room. Standard widths vary between 6", 12", and 18" per step, though other options can also be constructed. Steps size should be proportionate to room size. The wider the steps, the more materials and labor are required for the framing, painting, and trim work in the trey ceiling. An extra deep trey ceiling painted with an alternating accent color adds a lot of height and depth to the ceiling, without a huge expense. This type of ceiling treatment can look very appealing in master bedrooms of many different sizes and shapes. Standard height of each step in a trey ceiling is usually 8" to 10" per step. Thus a room may have an 8' ceiling height for the "outermost" portion of the ceiling not part of the trey, then 8'8" height for the first step, and 9'6" inside the trey itself. But heights can vary by room and design. Watch a video tour of the home pictured here - the Almodovar. 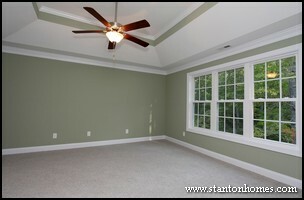 This master bedroom features a single step trey ceiling, with multiple layers of crown molding. The contemporary style master bedroom pictured to the left - from the Worthington - also features a shallow master bed alcove with recess lighting, plenty of windows for natural light, and soothing tones of grey. 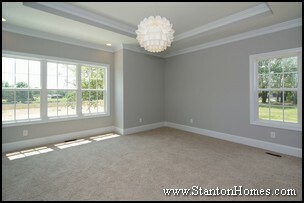 Contact Stanton Homes to talk about the design you'd like to see in your new master bedroom. Bring pictures, and explain what you have in mind! 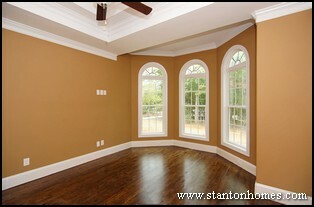 We blend your ideas with our expertise to create your custom home with everything just the way you want it. 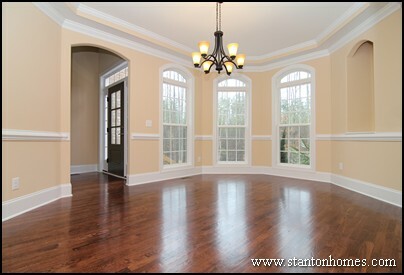 Stanton Homes never limits your choices to somebody else’s design – no two of our homes are the same. This handy guide to ceiling terms, by NC custom home builder Stanton Homes, will help you understand some of different ceiling options available. 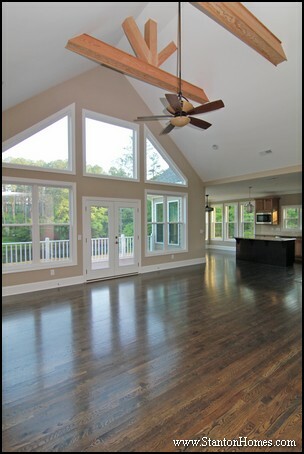 Tell us which types of ceilings you like, and we'll show you what it takes to build them into your Raleigh new home. The treatment of the top of a room is designed to evoke expression, and specialty ceilings can do this in a variety of ways. Understanding the different ceiling ideas and options makes it easier to discern what custom home builders are offering. What is a Conventional Ceiling? Usually 8 feet high, conventional ceilings may be either flat (look just like the walls) or textured, most often called "popcorn" (sprayed with particles that look like painted popcorn kernels.) A "smooth ceiling" is flat. If your contract doesn't mention smooth ceilings, ask what kind of ceiling is included. Homes at the upper end may even have 10, 11 or 12 ft high ceilings. Requesting ceilings that are more than 9 feet tall could add significantly to the cost of your new custom home, as most standard building materials come in shorter lengths, and more support may be needed for a taller ceiling. 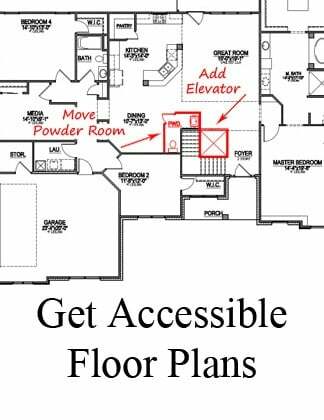 If your new home builder doesn't offer 9 feet as a standard first floor ceiling height, expect to pay $3000-$9000 to increase the height, depending on the size of the home. Conventional mouldings are one piece--made of one or two inch pieces of wood -- that cover the edges where the sheetrock touches ceilings and floors. In custom homes, mouldings can be wider, with two, three or four pieces stacked on top of each other for a more elaborate effect. The trey ceiling to the left has multiple layers of crown molding, which help define the layered trey and add to the details. 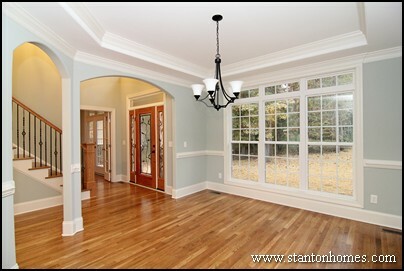 The doorways have a contemporary craftsman trim design, for a simple hand-crafted effect. The baseboard trim is extra wide, a traditional craftsman technique. 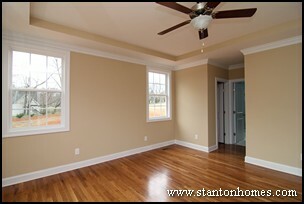 This master bedroom uses three different crown moulding treatments to accentuate the three steps in the trey ceiling. Home Buyer Tip: Ask your custom home builder which rooms include crown moulding, and how many layers, or pieces, are included in each room. What is a Cathedral Ceiling and Vaulted Ceiling? A cathedral ceiling provides a high sloping line up to the top of the house. A vaulted ceiling extends a room upward. Both provide a spacious feeling and make rooms feel larger. 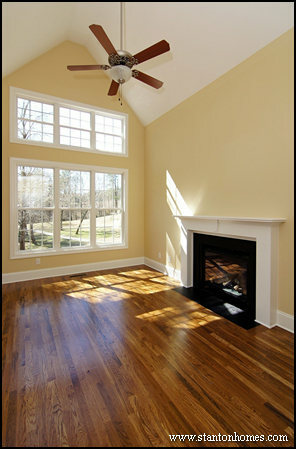 Vaulted ceilings are often found in first floor great rooms, living rooms, family rooms, and keeping rooms. Ceiling vaults are also being added to dining rooms, master bedrooms and master baths. 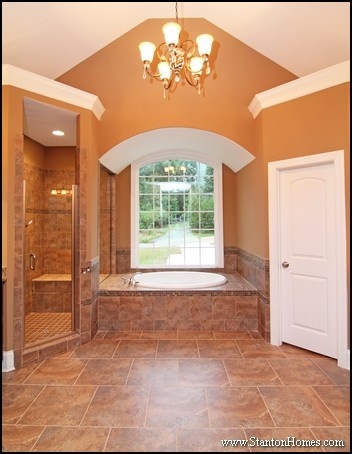 This master bath demonstrates one of many styles of vaulted ceilings. It adds spaciousness to a room that is both functional and luxurious. 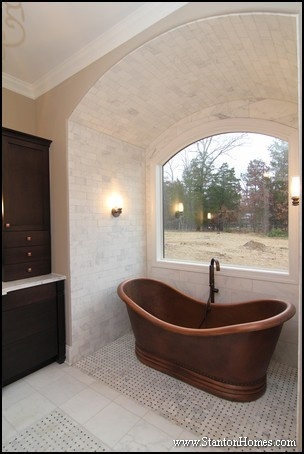 Vaulted ceilings in the master bath are becoming quite common, particularly in custom homes. Trey ceilings start horizontally at the wall intersection at a standard height and then are built upwards in a cut out resembling a tray. The cut can be vertical or angled, and the tray itself can be 6 inches to a foot or more deep. Sometimes there are a series of steps for an even more dramatic effect. Decorative mouldings or lights may also be incorporated. The trey ceiling to the right is constructed in two layers, allowing the homeowner to place lights inside the deeper trey, if desired, for a soft, etheral lighting effect in the master bedroom. Trey ceilings can be even more impressive when paint is used to accentuate the ceiling and vertical steps. 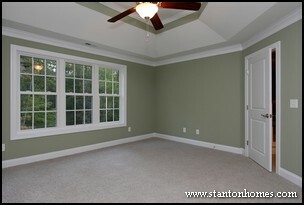 Trey ceilings are most common in dining rooms and/or master bedrooms. 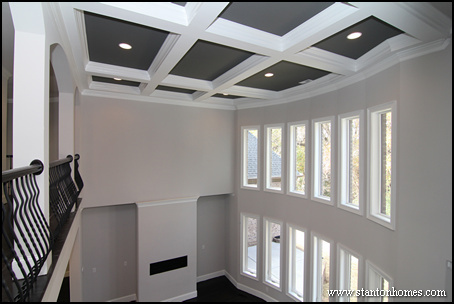 Tray ceilings are found standard in most custom homes and usually offered as upgrades in production homes. As an upgrade, the cost is generally around $1,000 for a very simple cut out trey ceiling with no crown molding, and no variation in paint color. What is a Cove Ceiling? A cove ceiling has a rounded concave surface. This may be incorporated into arched doorways, hallways (like the one pictured here), or other areas where a fluid effect is desired. These types of ceilings are an extremely delightful and rare art form - it's difficult to create a perfectly curved ceiling, because most building materials are designed to provide flat surfaces, and it takes extra materials, time, skill and creativity to craft the symmetrical effect. Cove ceilings generally curve up from every wall. It'll be hard to find one even in homes at the upper end of the spectrum. What is a Beam Ceiling? Made of wood or other substances which are typically laid across conventional ceilings to add dimension, color, clarity or interest. They can either be load bearing (incorporated into the actual structure of the home) or lighter weight faux beams that are applied purely for visual effect. This type of ceiling effect is not as popular as the more modern approaches and is more typically applied to rustic décor. 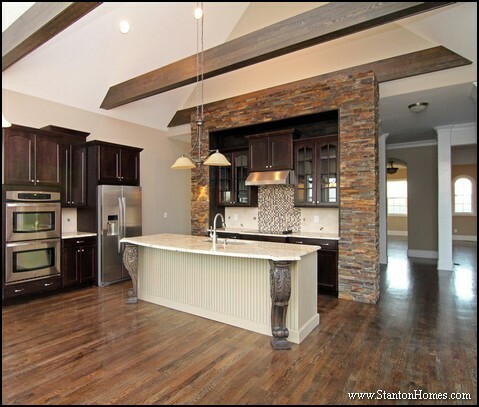 A beam ceiling treatment, particularly a stained beam ceiling, can add a significant amount to your new custom home budget. 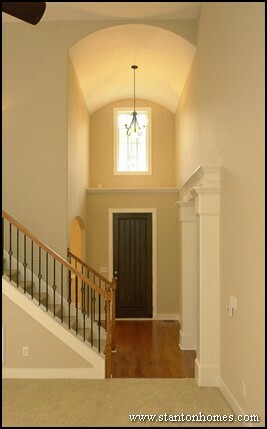 A barrel vault ceiling, also known as a tunnel vault or wagon vault, is not commonly seen in homes, but can be a very unique architectural feature. Think of the curved section you'd have if you cut a barrel vertically into sections - this resembles the curve of a barrel vault. These curved ceilings or openings were common in Roman architecture. But the most famous example can be found in St. Peter's Basilica, which has a huge barrel vault spans nearly 90 feet across the nave. 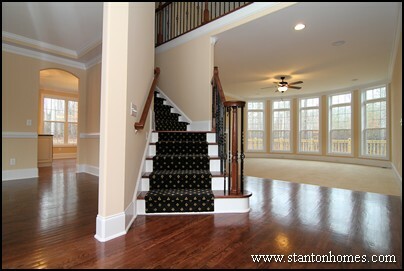 Stanton Homes built this home with a two story foyer and designed a barrel vault ceiling with multiple dimensions. The arched windows carry out the theme. The iron balasters and oak handrail give a nice contrast to the rounded lines. There is a built-in plant shelf above the foyer, which add to the opportunities for home accents. A coffered ceiling is best described as, "creating a raised and indented checkerboard across the ceiling". A coffered ceiling is usually created by framing a series of interconnected vertical and horizontal lines across the ceiling. The lines are then covered in sheetrock and finished similar to a normal ceiling. The individual boxes are then often trimmed with moulding - layering of which can be wider and thicker as the price goes up, especially in very high-end estate homes. Stained coffered ceilings are firmly in the luxury price point. This type of ceiling is not nearly as common as a tray ceiling, but is more common than cove ceilings or barrel vault ceilings. Before you buy, find out what will be included in the home you purchase, not just what's visible in the loaded model. 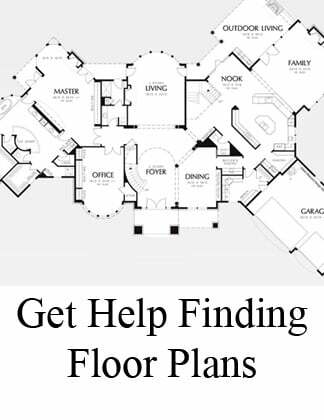 Ask very specific questions, and be sure your custom home estimate includes a very specific set of specifications. If you're a do-it-yourself kind of person, you may be able to add more trim work to your home later, but keep in mind that it will be nearly impossible to add a trey ceiling, a barrel vault ceiling, or increase a room's height after framing has been completed. 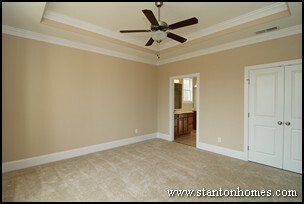 Each of the ceilings pictured has been created by Stanton Homes. We take pride in crafting a unique combination of ceiling treatments in each home we build - including dozens of styles of trey ceilings. 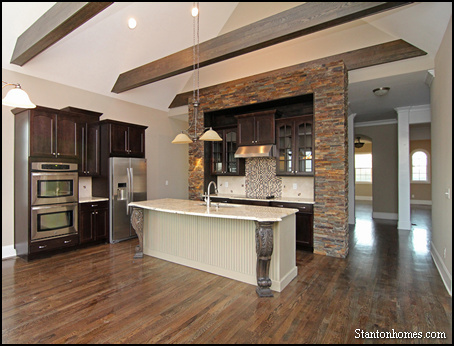 Stanton Homes builds new custom homes throughout the Triangle area of North Carolina – tell us your favorite floor plan, and we’ll walk you through you next steps to build your custom home.